Unique Simple Design with no moving parts. 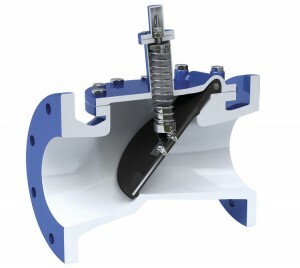 The Flapper does not swing from a Hinge Pin, it simply flexes open. The seat is on a 45° angle. The Flapper travels 35° from open to close usually before column reversal can occur. It has non-slam characteristics. The flapper is made of synthetic rubber (Buna-N standard). The valve can be buried and requires no regular maintenance. Recommended for Water, Sewage, Gas, Oil and Rubber lined for Chemicals. Ductile Iron Body with 125# class flanges rated to 175 PSI, 14 inch and larger Cast Iron Body valves with 125# class flanges rated to 150 PSI working pressure (other body materials and higher pressures available).